SANTA ANA, CA--(Marketwired - Jan 24, 2017) - Alexis Schulze, co-founder and chief visionary officer of Nékter Juice Bar, a modern restaurant and lifestyle brand offering guests an array of freshly made, nutrient-rich and affordable juices, smoothies and acai bowls, has debuted her first children's book, called Sneaky Spinach, aimed at encouraging young children and their families to eat healthier and live more active and balanced lives. Proceeds from the sale of the book will benefit local, regional and national non-profit organizations, causes and programs that benefit children in America. Schulze, with her husband Steve Schulze, founded Nékter Juice Bar in 2010 as a modern reinvention of the juice experience. While the juice bars of yesterday had lost their way -- offering a hodgepodge of sugar-laden, processed options that were marketed as healthy -- Nékter purposefully chose to offer a simple and truly healthy menu of fresh and clean juices and foods, free of processed ingredients, artificial flavors, added sugars, and unnecessary fillers. At the core of the concept is the fundamental belief that "healthy" can taste great, and be easily accessible and affordable for anyone who desires a healthy lifestyle, including children. "We always had a Sneaky Spinach smoothie on our 'secret' menu so our young guests would not reject them before they found out that healthy ingredients like spinach can actually taste great," said Alexis Schulze, co-founder and chief visionary officer, Nékter Juice Bar. "When we started brainstorming ways to have a meaningful impact on our communities, I wanted to find a way to integrate my passion for children's health and education. My hope is that this book will motivate children and their families to make healthier lifestyle choices, and benefit children across the country, including bringing real fruits and vegetables to lower income communities." Nationally, Nékter has partnered with Festival of Children Foundation and will donate $4.00 from each book sold in participating stores beginning January 25, and online at www.nekterjuicebar.com and on Amazon to support the foundation's mission of improving the lives of children by strengthening the charities that serve them. Festival of Children Foundation now supports more than 480 children's charities across the United States. "I am honored and delighted that Alexis and Nékter Juice Bar have chosen to partner with Festival of Children Foundation," said Sandy Segerstrom Daniels, founder and executive director, Festival of Children Foundation. "Alexis is truly committed to the welfare of children, starting with encouraging and supporting healthier lifestyle choices, and we so value her and Nékter's support of Festival of Children Foundation and its member organizations across the country." Schulze will also hold book readings, signings and "Sneaky Spinach Smoothie" demonstrations at local schools, libraries and other child-focused non-profit organizations, and will donate $4.00 from books sold at those events to the respective organization. A free Teacher's Guide will also be available for download at www.nekterjuicebar.com, offering primary-level educators the opportunity to easily integrate lessons around healthy eating into their curriculums. As chief visionary officer of Nékter, Schulze leads the company's research and development efforts developing menu items with only the freshest and highest-quality ingredients available. Before Nékter, Schulze had more than 20 years of experience working with children in both preschool and elementary school settings, holding a Bachelor's Degree in Child and Adolescent Development, and a Masters Degree in Cross-Cultural Education. 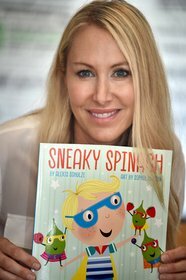 Her first book, Sneaky Spinach, is the story of a boy named Nick, who refuses to eat his vegetables. To help him understand how important fruits and vegetables are for his brain and body, a group of Super Spinach leaves sneak themselves into Nick's smoothies. Soon Nick notices that he is doing better in school and has more energy for sports and other activities, and begins to understand how eating right can make all the difference. Schulze plans a series of children's books with her second book now in development. Festival of Children Foundation is a 501(c)(3) non-profit organization that serves to bring together and coordinate the efforts of charities, companies and individuals who actively work to improve the lives of children. Festival of Children Foundation gives a voice, guidance and support. 100% of the administrative costs are covered by designated funding, allowing donations to go further in direct support of programs and services that improve the lives of children. www.festivalofchildren.org. Santa Ana, Calif.-based Nékter Juice Bar is the modern reinvention of the juice bar, offering a wide range of fresh, unprocessed, nutrient-rich, and affordable juices, smoothies, acai bowls, and juice cleanses -- made without unnecessary sugars, artificial flavors or processed ingredients. Nékter was founded in 2010 by two healthy living enthusiasts, Steve and Alexis Schulze, who wanted to offer a more modern and inspiring lifestyle experience rooted in educating people from all walks of life about the enduring benefits of a healthy lifestyle. Now an Inc. 500 and Entrepreneur Franchise 500 company, and recently named a "Hot Concept" by Nation's Restaurant News, Nékter has 66 restaurants in California, Arizona, Nevada, Texas, and Colorado, and plans to grow to as many as 300 restaurants in the next five years. The company seeks franchise partners, who want to own a business in the thriving health and wellness sector of the restaurant industry, and who want to make a real difference in their communities. For more information about the company or franchise opportunities, visit www.nekterjuicebar.com, or connect with Nékter Juice Bar socially at www.facebook.com/nekterjuicebar, or www.instagram.com/nekterjuicebar.